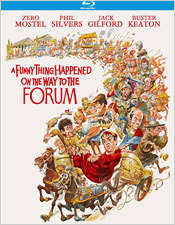 A Funny Thing Happened on the Way to the Forum was released in 1966, being based upon the stage musical of the same name that was originally written by Larry Gelbart and Burt Shevelove. The film was directed by Richard Lester and starred a cadre of comedy and acting talent, including Zero Mostel, Jack Gilford, Phil Silvers, Michael Crawford, and Buster Keaton in his final film appearance. The thing that you have to remember about the film before going into it is that it’s what was considered high entertainment at the time. Instead of being fastened down to single genre, the film contains a whole host of genres all rolled into one so that, as the opening number “Comedy Tonight” proclaims, there’s “something for everyone.” The main drive is comedy, of course, but you also have a historical epic, a musical, dance numbers, drama, romance, and a bit of action, as well. So looking for a concrete tone in a film of this type is just pointless, unless it goes for something dark, which it doesn’t. It’s light and fluffy, and meant to cater to a wide audience, just like its stage counterpart. For me personally, I’ve just never found A Funny Thing Happened on the Way to the Forum to be all that funny. It goes for nearly every comedy trick in the book to conjure up laughter, which includes puns, slapstick, mistaken identities, and, quite literally, running gags (in reference to Buster Keaton’s role in the film). Still, I can’t help but feel that if the film had had a different lead that it might have fared better during the time of its release. Zero Mostel’s mugging for the camera for a good portion of the running time gets old very quickly, and he feels a bit out of place, despite originating the role on stage. There were a few laughs to be had, of course, but they were too few and far between. It may also be that the film is just simply dated, and I’m not referring to the fact that it’s set in Roman times. It just feels quaint. Overall, I find the film to be more interesting than actually entertaining. For instance, Stephen Sondheim, Tony Walton, and Bob Simmons all having a working stake in the film with the music, costume design, and stunt work, respectively. The most interesting tidbit though is that Nicolas Roeg (director of The Man Who Fell to Earth and Walkabout) shot the film. So a lot of the intricacies of the actual making of the film are far more interesting to me than the film itself (let’s not forget about Larry Gelbart of M*A*S*H and director Richard Lester either). It’s a bit too old-fashioned and not as funny as I would have hoped it would be, but it might also be that it’s just my personal tastes. I’m sure that there’s enough of a cult audience that appreciates the humor and the musical numbers a lot more than I do, which is funny because I do enjoy musicals, but this one just fell flat for me. Kino Lorber’s Blu-ray presentation of A Funny Thing Happened on the Way to the Forum features a transfer that is both a disappointment, but not a total loss either. The presentation featured on this release is quite soft and lacking very fine detail. Grain is present and hasn’t been tampered with, but the overall softness just makes things look too smooth and generally unrefined. Colors also aren’t all that impressive, especially skin tones which lean heavily towards pink. Blacks are ok, and contrast and brightness are at acceptable levels. Again, there weren’t any signs of digital tampering, but there were some minor film artifacts left behind. For the soundtrack, there’s a single English mono DTS-HD track. While it’s not a terrible soundtrack, it’s definitely dated and a bit muddled. Dialogue always comes through well, as do the musical numbers and sound effects, but it’s all a bit too congested-sounding at times. There’s not enough room for the multitude of sounds to breathe. You can definitely pick up on the pre-recorded songs when they are being sung, as well. And you won’t find any dynamic range or low end boost at all. Still, it’s not a bad soundtrack, but probably could have been opened up a bit more with a wider soundscape, maybe in stereo or 5.1. There are also subtitles in English for those who might need them. Like most of the recent Kino Lorber Studio Classics releases, the sole extra found on this Blu-ray is the original theatrical trailer. For fans of the film who are thinking of upgrading, this is a slight upgrade in quality, but I’m sure there will be a new transfer of the film sometime in the future with much more fine detail in the image and a better extras selection. But for now, you can be content with this being a marginal improvement over its DVD counterpart.